The results for stop 1 of the Wake and Ski Boats UK Rider League are now available online. Congratulations to all those who competed. Read on for the full press release. After the long, hard, harsh winter, the wait was over. The wakeboard season was finally here. Tees Barrage was the all new venue on this years circuit. The morning started very cold and wet. The Rider League crew arrived on site at 8.30 closely followed by Michael from MasterCraft Boats UK with the hot of the production line 2010 X-2. They very quickly converted the club site into an event site and the first of the riders started arriving. This years new format allowed for the new rookies to get time on the water and a few practice sets for the early risers. The weather started to change for the better and we even saw the sun making an appearance. With the P.A. in full swing the boat crew doing a sterling job the main event was ready to start at 12.00. We had riders in the following divisions:- Rookies, Ladies, Junior Men 2, Junior Men 1, Masters 2, Masters 1, Open Men and Outlaws. The new format allows an extended run with a further fall allowed, this meant riders were going big and trying some big stuff. The junior men division saw Jack Wright and Ben Edwards going head to head against each other, a very close battle but in the end Jack Wright coming out on top. In the ladies with the addition this year of Megan Barker and Nancy Creedy into the division things were going to be tough for the existing ladies. Sure enough Megan Barker went out and showed no signs of slowing down on mission to get to the top of ladies wakeboarding. Nancy Creedy was back on her heels and showing an accomplished side to her riding, watch this space as the season unfolds. Into the Junior Men division and we saw a few newcomers to the tour in form of young Ed Blundell and Joel Sayer, both riders at West Midlands Waterski and showing great form behind the awesome X-2 wake. Ed Blundell taking honours just ahead of Jonny Lodge. With competition the fiercest in the Masters division, this year it has been split into 2 divisions with the plan being that top spot of div 2 will be promoted to Masters 1 for the 2011 season!! So div 2 pitched 4 riders against each other, and with George Wright picking up an injured ankle it paved the way for a battle at the top between Steve â€˜Hardmanâ€™ Thompson and Martin Webb. A close battle was on but an elated Steve Thompson took top podium spot with Calmwater Bayâ€™s Jon Burke taking 3rd. Masters division 1 saw the old warriors Mike Heaton and Billy Clough resuming their on water rivalry, along with newcomer Ronnie Hart who rode very well pushing into 3rd spot. Billy just managed to edge out Mike for the top points. Open men saw the top 2 spots being dominated by newcomers Matt Williams from West Midlands taking gold and local hero Scott Penman taking silver. Nick Horsfall rode very well to get into third place. Then with the day drawing to an end it was down to the last division, Outlaws. Elliot Lux and Carlos Fandango showed the crowd some great riding but the top spot this time went to southern rider Luke Thomas from Isis in Reading with a huge run going big with some great technical tricks. With the sun shining for the presentation there was the prizes given out and thank youâ€™s given to this years tour sponsors. MasterCraft Boats UK, Fox Clothing, Alliance Magazine, Wakeboard UK, Xtreeme Gene, Watersports World. These people have all contribute to the overall tour this year and there are some great prizes up for grabs for the overall tour winners, including vouchers, holidays, and clothing. Once again this year the existing team of supporters Brian Rook, Mike Clarke, Perry Lux, Ryan Davis amongst others did us proud on the day. Tees Barrage and in particular Ian Robson and Mike Cook did a great job being the host for the day. 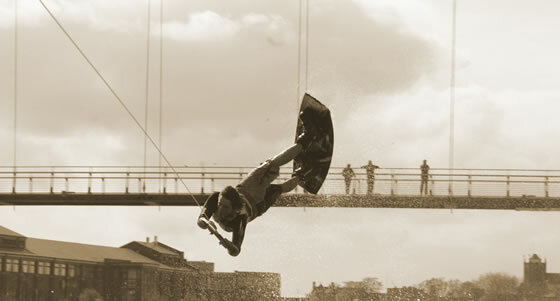 View the results on the Wake and Ski Boats UK Rider League Stop 1 Results Page.